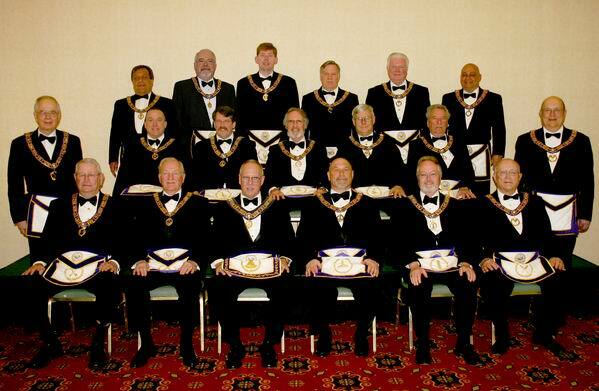 2010-11 Grand Lodge Officers – The Grand Lodge of Connecticut A.F. & A.M.
(front row, from left): RW Brothers Charles C. Maxson (Grand Treasurer); James T. McWain (Deputy Grand Master); MW Charles A. Buck Jr. (Grand Master); RW Brothers Gary W. Arseneau (Grand Senior Warden); Simon R. LaPlace (Grand Junior Warden); Robert G. Fitzgerald (Grand Secretary). (middle row, from left): RW Brothers William F. Lott (Deputy Grand Treasurer); Michael B. Dodge (Grand Marshal); Theodore J. Nelson (Grand Senior Steward); Thomas M. Maxwell II (Grand Senior Deacon); Donald W. Dean (Grand Junior Deacon); Marshall K. Robinson (Grand Junior Steward); Anderson H. Ziedler, Jr., (Deputy Grand Secretary). (back row, from left): RW Brothers Gary A. Littlefield (Grand Historian); Bruce R. Bellmore (Grand Chaplain); Carl H. Anderson (Grand Organist); Richard C. Memmott Sr. (Grand Tiler); Robert L. Jess (Associate Grand Tiler); Joseph F. Massa (Associate Grand Tiler).